In addition to broader coverage of the US VC market in Q1 and Q2 of this year, Crunchbase News also analyzed VC funding in Texas in Q2. The reporting team here is looking to cover more hubs from off the beaten path in the near future. The American Midwest, to some, is just the “flyover states.” Its tropes – rusted-out factories, cornfields, and calorically-dense fried foods at state fairs – are well known. However, it’s also increasingly home to more technology startups. Looking through the lens of startup and venture capital funding activity, we’ll be looking out how the midwest and its metros stack up against one another. This is an extension of Crunchbase News’s growing coverage of startup ecosystems outside Silicon Valley, New York City, and Boston. What, exactly, constitutes the Midwest? A 2014 survey by FiveThirtyEight had 10% of respondents say that places like Wyoming and Pennsylvania are Midwestern states. That’s a stretch. At Crunchbase News, our definition of the Midwest will be based on the US Census Bureau. Twelve states – Illinois, Indiana, Iowa, Kansas, Michigan, Minnesota, Missouri, Nebraska, North Dakota, Ohio, South Dakota, and Wisconsin – make up the official group of Midwestern states. Since there is no one “right” way to go about ranking the metropolitan regions in each of these states, we have opted to do a lot of rankings instead! 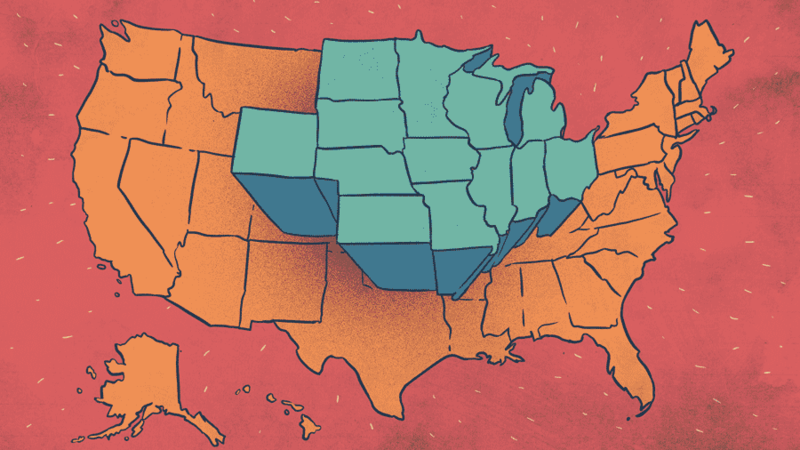 We’ll be sure to keep track of which cities perform the best in each of these rankings, which will produce an all-around ranking for the best of the Midwest. Before we continue, it’s recommend that you don’t fly over the rest of this post. The number of companies founded in a particular geographic area is a good proxy for the amount of entrepreneurial activity happening. And, when these figures are gathered for a number of areas, we can compare the absolute level of new startup activity. In Crunchbase’s data, we were able to find exactly 1,000 startups founded in Midwestern states with “founding dates” between January 2015 and the end of July 2017. Aggregated around metropolitan regions, here’s how they all compare. Of course, there’s the possibility that these numbers are slightly skewed. Not every company in Crunchbase’s dataset has a founding date listed, so it’s likely that there are more companies that have been started than what’s listed here. However, although the exact numbers might be a bit off, there are notable trends when marked proportionally. Over five times as many companies were founded in Chicago than in Minneapolis. Interestingly, the Detroit metro area saw roughly the same number of startups starting up as Minneapolis, despite having a population that’s 30% smaller and comparatively less well-off than the area around Minneapolis and Saint Paul, MN. According to the MSP Regional Economic Development partnership, the greater Minneapolis-St. Paul metro area is home to seventeen Fortune 500 companies, which is “more per capita than any other metro region.” The abundance of good jobs in Minneapolis may explain why startup founding activity, on a per-capita basis, is lower. A “third tier” of cities like Cincinnati, St. Louis, and Indianapolis seem to chug along quite nicely. But still, those metro areas pale in comparison to market-leading Chicago. The number of investment rounds in local startups is another important measurement of vibrancy in a startup ecosystem. We analyzed just under 2,400 venture capital deals struck with companies based in the Midwest between the beginning of January 2015 and the end of July 2017. This gives us a relatively broad measure of startup ecosystems in the broader region. Again, Chicago leads the pack, a trend we’ll see throughout other rankings as well. That being said, the relative difference in venture funding activity is less dramatic than our ranking of startup founding activity. Since 2015, Chicago only had a little over three times as many venture rounds as Minneapolis. Although the number of VC deals point to a more “absolute” yardstick of investor interest in a metropolitan region, the dollar volume represented by those deals often draws a starker comparison between ecosystems. Of the 2,400 deals we analyzed from above, roughly 1,840 of them had dollar amounts associated with the round. Here’s how the metros compare. Please note that there were around 560 rounds for which we didn’t know much money was invested. Again, like with our measure of startup founding activity, this means that the actual dollar volume invested into these markets is greater than what’s listed here. However, like with previous measurements, there’s strong reason to believe that the relative rankings are sound. It goes without saying that investors are a necessary ingredient in healthy startup ecosystems. And there are many kinds of investors, broadly defined in two categories: institutional and individual investors. Here, we’re focusing only on institutional investors of a few types, specifically venture capitalists (so-called “micro VCs” and “regular VCs” alike), accelerators, incubators, seed funds, and angel investor networks. Here’s the ranking of metropolitan regions in the US ranked by the number of institutional investors. Again, mostly by dint of being a major financial center, as well as being the region’s biggest city, the Chicago metro area is home to the most institutional investors in the Midwest. Although Minneapolis places third in the rankings here, it’s also home to a vibrant scene of mature and upstart life sciences companies, which are capital-intensive to start up and run. This could explain Minneapolis’s strong performance relative to Detroit and other metros in the ranking of total VC dollar volume. We’ve taken a look at the number of different metrics, each time comparing the relative performance of over 50 metropolitan regions in the Midwest. But now it’s time to bring it all together to see which metro regions are the “Best of the Midwest” for entrepreneurs and investors alike. Again, it’s no surprise that Chicago ranks at the top of this list. Some might say it’s unfair that such a big city is placed at the top of this list, but it makes sense that Chicago ranks as #1. In startups and venture capital, networks are everything, and cities with bigger, more variegated populations typically have the richest networks. There are, no doubt, plenty of opportunities for entrepreneurs and startup investors in smaller Midwestern cities to find a path to success. So if you’re from Omaha, Kansas City, or other cities on this list, take heart. And if you do find yourself in need of a “bigger pond,” Chicago’s just a few hours’ drive through the heartland away.